The cabin lies up a track above the woodlands beside Froe Creek near Portscatho. It has its own large garden with lawn, trees, shrubs and glorious views from the china clay mountains to the sea, or across the river to St Mawes. 300 or so metres from a wonderful sandy beach and the South West coastal footpath, it offers a perfect base for relaxing in peace or exploring one of Cornwall's most beautiful areas, the Roseland. If you are lucky, you may spot the seals which also visit the beach, egrets sometimes fish in the creek and a pair of resident buzzards often circle above. The nearest village, Portscatho, has a good general store open 7 days a week, a butcher, pubs with wifi and is only a mile and a half by road, or on foot by the bridle way or the coastal path. Cornwall's capital, the cathedral city of Truro, and the busy historic port of Falmouth with its Maritime Museum can both be reached by the picturesque King Harry Ferry (which reduces a 20 mile journey to 8 miles). These are lovely old fashioned but contrasting towns and a joy to shop or eat in. There are many other beautiful walks around the headland to other beaches and the lighthouse at St Anthony Head, with beautiful views of the whole bay. Known as the Carrick Roads, this is one of the deepest natural harbours in the world. River and sea ferries take you to the Tudor castles at Falmouth and St Mawes, and several sub-tropical gardens including Trelissick (just across from the King Harry Ferry) or even to Truro. Water sports of every sort, sailing, kayaking, wind surfing etc. abound. The lost gardens of Heligan and the Eden Project are about a 45 minute drive away near St Austell. The rest of Cornwall is easily accessible including the Tate Gallery at St Ives, the Lizard, the Atlantic Coast and Bodmin Moor. A charming chalet very much off the beaten track. We loved spending time in the cabin playing some of the many games in the well stocked trunk but also used the chalet as a base for exploring the outstanding beautiful Roseland Coast. We were exhausted every night and slept comfortably and soundly. There are some other chalets close by (not evident from the pictures) but don’t be alarmed. The massive mature garden that comes with this property gives you lots of privacy. The accommodation is basic and is well worn but clean. I hate the phrase shabby chic but that is probably closest to describing it. It was very practical and perfect for us. It is a property that is clearly used a lot by the owners (very well equipped) and is clearly loved. Four of us (two children aged 11&12) and a dog stayed in comfort. We had a blast. Just do remember there is no popping to the shop and so try to ensure you are well stocked!! The communications with our host was superb. We had a slight problem with the key and they arranged for someone to come out and sort it the next day (Sunday). They are very polite and very friendly. I think it’s safe to say that we will be back!! Large garden with fruit trees. Local beaches delightful (excellent rock pools and sandy beaches) with plenty of local places for a cup of tea and icecream! Amazing local walks around the peninsula, and to the little ferry to St Mawes. Plenty to do! Cabin comfortable but this holiday will not suit you if you are after luxury! A really lovely family holiday filled with simple pleasures - our kids (aged 10, 7 and 4) loved it! We had a great stay with our two children and dog. The cottage is walking distance from Towan beach, which was fantastic (dogs allowed all year and the highly recommended Thirstea Co tea and snack van). The cottage has a really cosy, homely feel to it - like an oversized beach hut - and had everything we needed. The children didn't want to leave and I'm sure we'll be coming back another year! Beautiful location. Beach within easy reach without having to walk on any roads to reach. Porthscatho within a 30-40 minute coastal walk. The walk is worth it on it's own but good food and drink when you get there tops it off. Seals, dolphins, gannets and one hump back whale spotted on the walks. A lovely cabin for a Family holiday. We enjoyed near continuous sunshine in this part of Cornwall. The cabin is not extensive, but contains all the essentials & has a nice homely feel to it. It didn't contain considered modcons, but that didn't matter; we happily changed our routines. The garden is extensive & perfect for an evening bbq, enjoying the sunrise or allowing Kids & animals to let off more steam. Our morning walk to the local Towan beach took a leisurely 10 minutes. We also walked through the lanes & fields to Portscatho village & beach, where a nice pub offers good food & local ales. In the other direction is a 40 minute walk along the Percuil River to catch the ferry to St Mawes (why waste car fuel). We are sure the sunny weather helped make our Family holiday great, but we would highly recommend this location & cabin to a Family of 4 & dog. If the weather had closed in, it would have been walks along the rugged coast, with an evening board game from the large trunk in the bunk-bed room. It is peaceful, feels secluded & allows you to enjoy the simple pleasures of being on holiday. Our hosts responded to our reqeust very quickly & provided information & keys promptly. If you want 5 star perfection then this isn't the accommodation for you. However, if you love peaceful,relaxing,secluded,quaint, wildlife, nature, dog friendly and fabulous coastal walks then you will find this holiday perfect. Beautifully situated 5 mins walk to a great, quiet dog friendly beach and a lovely 25 mins walk to 2 great little villages of Portscatho and Gerrans ( saw 3 deers, a fox, tawny owls,bats, buzzards and a sparrow hawk on the walk). Both pubs have great dog friendly pubs (The Royal Standard and the Plume of Feathers) serving lovely, good value food. Also a lovely little restaurant called the Boathouse which is also dog friendly and serves amazing food. 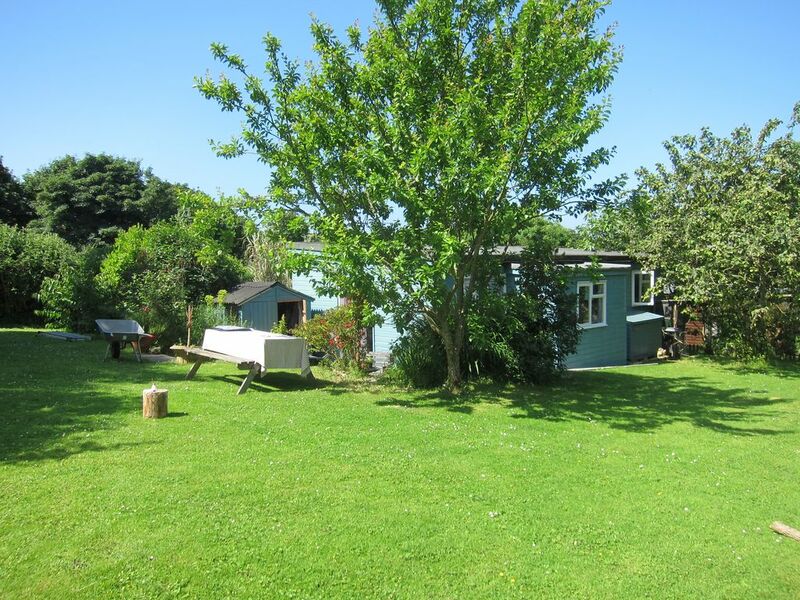 The chalet is basic but very charming with everything you need.and a lovely big secluded garden. Had a lovely relaxing week. The Roseland peninsular, with St Anthony Lighthouse, protects the entrance to Falmouth Bay in South Cornwall. Ferries go to St Mawes, Falmouth and Truro, centres for sailing, historic monuments, sub-tropical gardens, museums and shops. There are several wonderful beaches, circular coastal walks with beautiful views of both rivers and the sea. The cabin is about 300 meters from the nearest large sandy secluded beach. It lies up a rough, driveable track from the road at Froe Creek.